I love the look of this watch! The ceramic and stainless steel, also the large numbers are a plus! What's not so great is the water I have under the glass face. It's supposed to be water resistant. The mineral-crystal has a great sparkle. The bezel is a nice size and has very solid band and pins. This watch is very pretty and sparkly. The only thing that I wasn't very happy about when I first got it was that the bracelet Is white (obviously is ceramic!) but I did not pay close attention to the picture when I bought it, I thought it would be all silver tone. I do not really care about that anymore, I get compliments from anybody who sees the watch/ If you want a watch that is sparkly and will catch everybody's eyes, look no further! My Crystal watch is so pretty and it goes perfectly with my bracelets. I love the color and it fits perfectly. I purchased this watch for myself. I had been looking for a silver and black watch to blend in with some other jewelry I have. When I saw this watch, I couldn't resist from buying it. The watch is high quality and so beautiful. I am very pleased. I loved the watch! it is beautiful and I get a lot of complemets when I wear it. The contrast between the white ceramic and the silver in the bracelet is more noticeable in person than in the picture. Nice! Nice watch but the one I received appeared to have been previously worn. 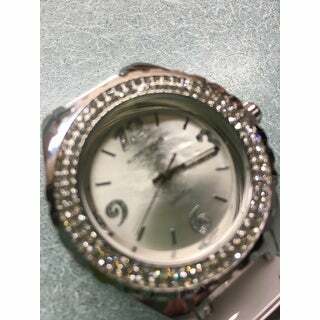 The protective film was missing from the crystal, the inside of the band was dirty and the battery was operating. Not what I have come to expect from Overstock. Light and comfortable. Love the white in the bracelet. Ordered the last one! The color is neutral and will go with any outfit. 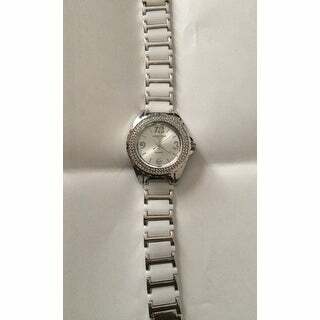 The band is well designed with cream colored ceramic and a substantial clasp The face is easy to read. 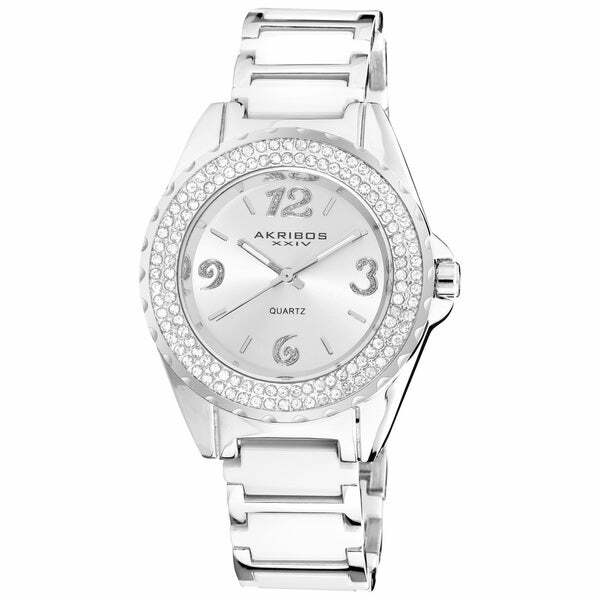 The rhinestone bezel adds just enough bling that the watch can be dressed up or down. The watch was delivered 3 days earlier than projected--bonus! I really like the look of this watch. The shiny ceramic with the silver is pretty. I thought the numbers with bling would show more bling, but I'm not disappointed. Quality is good and bling around face is a nice touch. Happy with my purchase. I normally find great watches here and have good luck with Akribos, but not this time. I felt it looked nothing like the picture and was very cheap looking. To me it wasn't even worth the sale price. Returned it right away. Nice watch for the price. 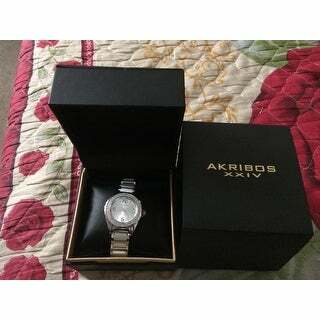 This is my second watch from Akribos. Im very happy with my purchases. Great watch for the value. However, you will probably have to remove some of the links for a better fit. Beautiful watch. Even better looking when I received it. I love this watch! Stopped working after 2 months. Very attractive but band is way too big and I have a large wrist. Have to take it to a jeweler to have band reduced or replaced. My mother loves this watch. She were's it ever sunday too church. Nice dress watch. Only problem I ran into is I had to replace the battery after 6 months. "Can I remove the links easily myself or does it need to be taken to a jeweler?" YouTube has numerous guides if you are DIY kind of person. "How can you remove excess links from this ceramic band? " Yes, the excess links can be removed, I had to have several removed.